The pup is invited to this seasonal suds hang. Plus? Look for dog-themed vendors galore. Celebrate your most special buddy, and try some seasonal suds, at Angel City Brewery on Saturday, Oct. 28. So you're sniffing out a seasonal soiree that A) will have some mighty major suds, the kind of craft sips you'll look back upon, with fondness, for years and B) your pup can attend, in costume, if that's his preference. That can be a tall order, as tall as a Great Dane, but somewhere, deep inside, you know that a spot in Southern California will deliver on this hope, ahead of Halloween, given our affinity for hanging out with our hounds while sipping something foamy that's been made with an excess amount of care and creativity. Best trot, Great Dane-style, for the Arts District on Saturday, Oct. 28, when Howl-O-Ween: A Pooch-tacular Party for Pups and Pint Lovers sets up shop at Angel City Brewery. It'll take up a chunk of the afternoon, much like your pup likes to fill out most of his bed, and then some, when spreads out, so plan on chilling out, alongside your furry friend, from noon to 4 o'clock. What's there to woof about during event? 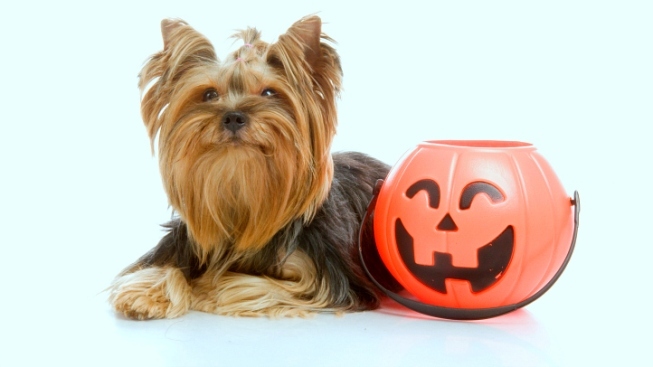 "Two-legged and four-legged creatures alike will receive treats for tricks while enjoying grub, games, getups, and K-9 themed goodies." A pair of recently released beers from the brewery will be two of the sudsy stars of the day, so plan on tasting Number of the Yeast, "a devilishly bitter ale," and Zero Flocs Given, "a New England-style IPA" that leans into its citrusy notes. Charlie Nunn Photography will be in the house, in case you need a super-sweet canine snapshot (that'll be a "yes"), and dogs are invited to show in costume. Which, of course, means a canine costume contest will be part of the dogly doings. Don't have a pup, or perhaps your own tail-wagger is the stay-at-home type? You're invited, so show up and get in the convivial, pre-Halloween swing.